Over the past few months I have become very interested in programming. I have been taking some computer science courses at Carleton University and fallen in love. I love the structure and rules! This weekend Toby and I purchased our summer seeds and began to draw out the master plan for the garden. We have sectioned off an area around 1.5 acres which will contain over 40 garden beds, the berry patch, two or three green houses, the goat pen, the chicken coop and the compost. We are still working on the first draft of garden plans but I will post when we have something finished to show. After purchasing an outrageous amount of seeds we decided that we would need some kind of system to keep track of the details of each plant (companion plants, average yield, spacing, season and our personal experience growing and eating the plant). So we have a new exciting project on our hands. The creation of a program/script that will store profiles for each plant and eventually plan out a garden based on the desired plants. Right now I am just gathering the information from the internet, seed packages and our brains to start the profiles. This will be a long term project for me and a great learning opportunity, I look forward to blogging about it along the way. 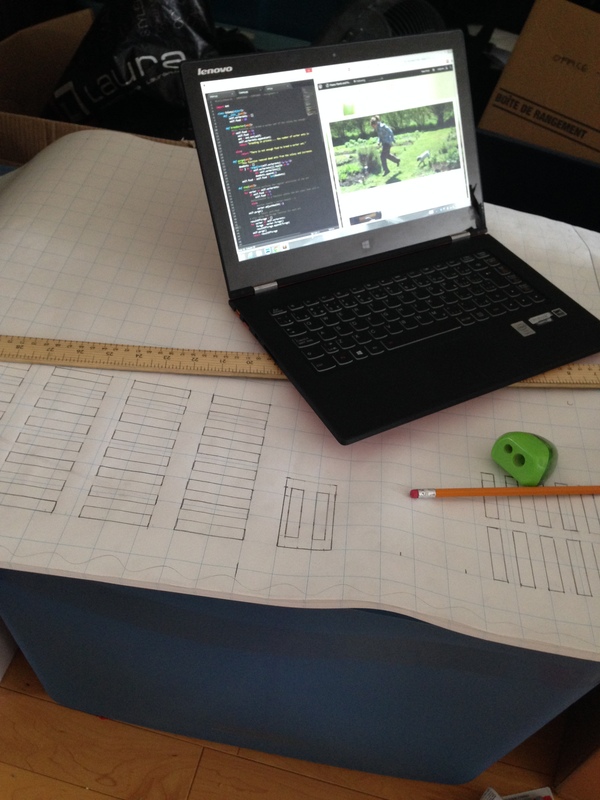 I like to do my programming on my laptop so I can move around the house as I go. Recently my Macbook Pro bit the dust and I purchased the Lenovo Yoga 2 Pro. It is a fantastic little machine! It is a convertible laptop, tablet and really doesn’t sacrifice in either mode. Before purchasing I compared about 10 models in a similar price range and found the yoga to be the best bang for my buck. I am very happy with all of the features excluding the built in web cam. It is a low quality camera made worse by the stunning screen resolution (3200 x 1800). It comes equipped with Windows 8 which I enjoy for internet use but leaves much to be desired as far as programming. I had a bit of a dilemma. I was excited to start writing scripts for our program but did not want to use Windows 8. 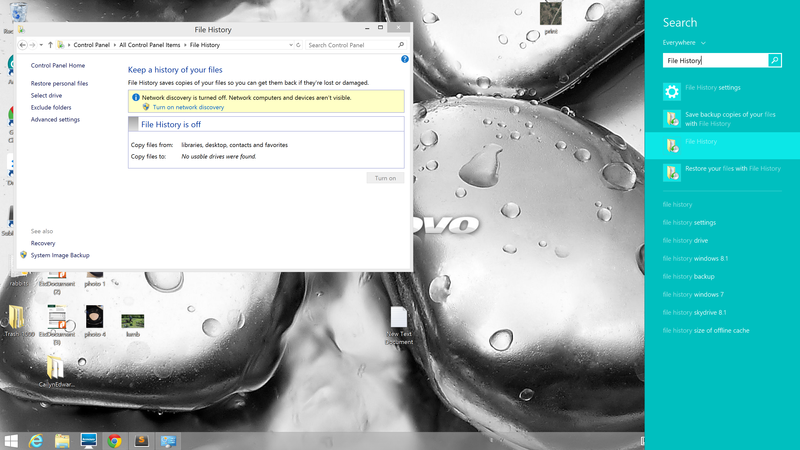 I decided to install Ubuntu along side Windows which was not a simple task. I’ve decided to write a step by step guide just in case any of you “new to programming or computers people” want to give it a try. This will be specific to the Yoga 2 Pro but applicable to most PC laptops(with some minor adjustments). 1. Search your PC for “File History” and open it. 2. 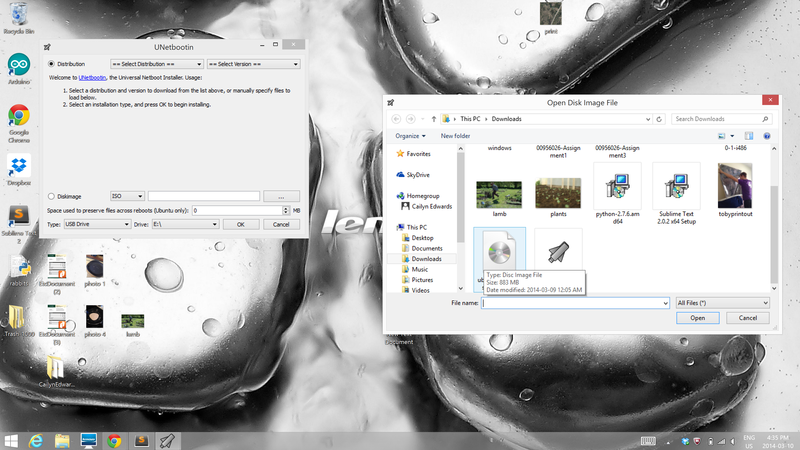 Click “Create a System Image” in the bottom left hand corner. 3. Connect an external hard drive and create the image there. You can back up your computer several different ways. This was the method I used, but I was not super concerned because it is a new computer and I have no media on it yet. 1. 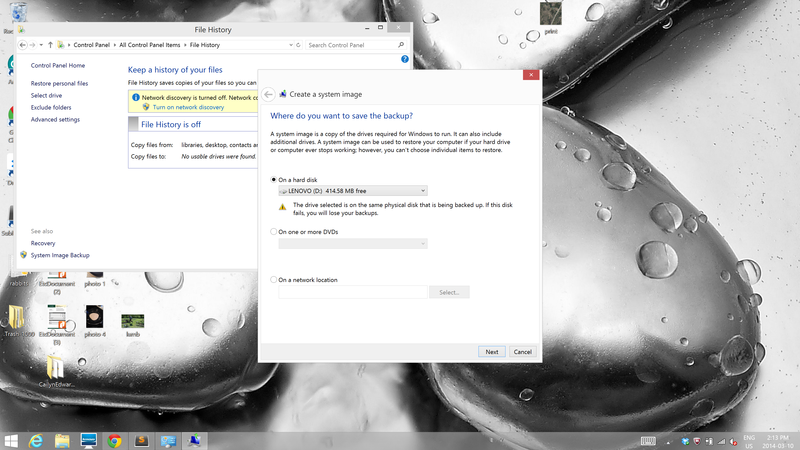 Search your PC for “Disk Management” and click “Create and format hard disk partitions”. 2. Right click the drive containing the OS (operating system). In this case it is “Windows8_OS (C:)”. 3. Click on the option to shrink volume. 4. When the window opens it will determine the size necessary for Windows to run. Its best to leave this as is. Click the shrink button. 1. Download your preferred version of Ubuntu. 4. Insert a blank USB drive and select the disk image option. 5. Click the … button and select the downloaded Ubuntu ISO. 6. Double check that the USB drive is specified and click OK.
7. Open the USB drive. Go in to the boot folder and then the grub folder and open the grub file in a text editor of some kind. 8. Add “acpi_backlight=vendor” before “quiet splash” and save. 1. Turn off the computer and start using the novo button. 2. Enter the BIOS configuration. 3. In the security menu disable Secure Boot. 4. 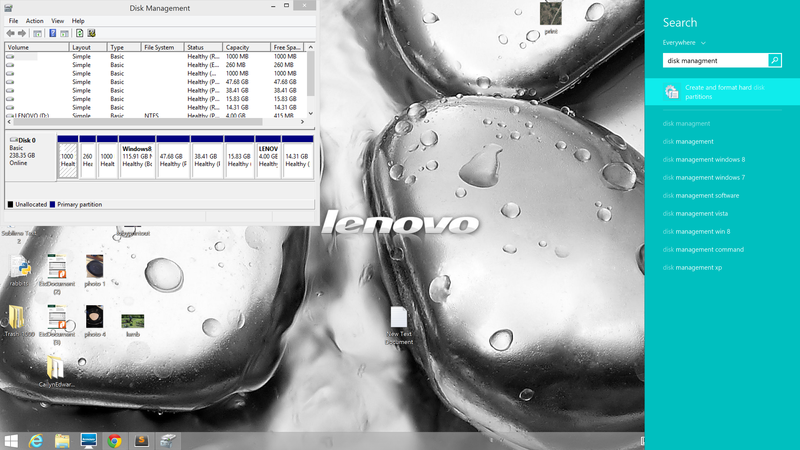 In the boot menu disable Lenovo Fast Boot. 1. Turn off the computer and turn in back on using the novo button. 2. Select USB boot from the menu. 5. Check the box beside “Install this third party software”. 1. When the menu asks you to select installation type click the radio button beside “Something else” and click continue. 2. Select the device labeled “Free Space” with the larger size listed (somewhere around 500 000 MB), click the plus button and create a logical partition. 3. Mount the partition to / and set the size to 51 200 MB. Set the partition type to EXT4. 4. Once again select the Free Space and click on the plus symbol, create another logical partition, mount this one to /HOME and set the type to EXT4. Make the size all the unpartitioned space minus about 16 384 MB. 5. Create a third partition by selecting Free Space, and choose SWAP as the type. Use the remaining space. 6. Make sure the bootloader is pointing to “/dev/sda” and the format checkbox is checked for the / and Home partitions you have created. 7. Complete the installation Process. 1. Turn off your computer and turn it on using the novo button. 3. Select “Advanced Ubuntu”, enter recovery mode and when the menu opens choose root console. 5. Scroll through to GRUB_CMDLINE_LINUX_DEFAULT=”quiet splash” and modify to GRUB_CMDLINE_LINUX_DEFAULT=”acpi_backlight=vendor quiet splash”. 6. Exit the page and type update-grub2. 7. Save, exit and restart your computer. 2. Type “sudo rmmod ideapad_laptop”. After all that you should have no problems running ubuntu on your machine. Easy right? Geek girl! I don’t even know how to install ubuntu! Now I know who to go to if I ever want to. Just one question: In Step 7 – #2 says “Select” but doesn’t actually specify what needs to be selected from the menu after booting using the novo button. Thanks for the feedback! I think I must have just been typing a little fast but all fixed now!! Nice step by step guide.! I broke down the system while trying to install ubuntu. 😀 Than i came across your tutorial. It’s really what i need. Now, everything is OK. Thanks for the tutorial.